These days, the best gaming laptops are packed with more power than we’d ever dreamed of. MSI gaming laptops, especially, packed with Nvidia Turing graphics and Intel Coffee Lake processors are able to play all the latest AAA PC games maxed out at high resolutions – some with real time ray-tracing enabled. However, before you head out and pick up the first MSI gaming laptop you see on the shelf, there are a few things you need to think about. What games are you trying to play? Are you all about that eSports life, vying to top the leaderboards in Overwatch or be the last person standing in Apex Legends? Or, do you want to immerse yourself in the latest RPG with all the eye candy turned on? This is a lot to think about, but we’ve put our laptop expertise to good use, gathering up the best MSI gaming laptops on the market right now, so that you aren’t left grasping at straws. And, because we’ve included our exclusive price comparison tool, you can be sure you’re only getting the best deal on your shiny new MSI gaming laptop. There’s this traditional image that many people have for gaming laptops: a thick brick of a device that you can’t carry around in your backpack. And, while there are a couple MSI gaming laptops like that, the MSI GS65 Stealth is the exact opposite. Measuring just 1.16 inches thick and weighing 4.19 pounds, this laptop will let you take up to an Nvidia RTX 2080 on the road, without blowing your back out. It also helps that it’s gorgeous: an all-black design with gold accents and RGB lighting. If you can afford it, you can’t go wrong here. Sometimes you just need a tank to get the job done. Sure, there are all kinds of gaming laptops out there that are thin and light and can get the job done. But, what if you’re looking for something with a bit of extra juice? Well, the MSI GT75 Titan is the MSI gaming laptop for you. This beast features full-fat Nvidia RTX graphics and up to 32GB of RAM, meaning that no matter which game you’re playing, nothing will slow you down. Even professional video editing programs will be smooth as butter, too, so you can record and edit your gaming highlights without breaking a sweat. Gaming laptops, especially since Nvidia’s RTX lineup hit the street, are more expensive than ever. Packing a thin and light package with powerful hardware gets expensive, so when we find an MSI gaming laptop that offers a prodigious value, we take note. The MSI GF63 isn’t the most powerful laptop on the market, far from it, but with up to an Nvidia GeForce GTX 1050 Ti, you’ll be able to get great framerates in your favorite esports titles without paying a fortune. Add that to the attractive chassis and super-thin bezels and it’s not hard to see why it’s just a great buy. It doesn’t come with an SSD out of the box, but with a screwdriver and 15 minutes of your time, you can fix that. It’s easy to find an MSI gaming laptop that really grabs your attention, the svelte design of the GS65 Stealth, the titanic performance of the GT75 Titan. However, sometimes finding something right down the middle is the best move. And, while we haven’t reviewed the MSI GE75 Raider quite yet, the high-end specs should deliver comparable performance to a much thicker laptop without sacrificing portability. It’s not quite “thin and light”, but you should be able to carry it around. And, that space you’re getting over something like the GS65 Stealth means you can upgrade it however you want – you can even fit two NVMe drives in there. 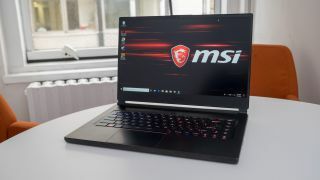 If you’re looking to get your hands on an MSI gaming laptop with modern Nvidia RTX graphics, you may have already resigned yourself to paying nearly two grand. Luckily, you don’t have to do that – the MSI GL63 delivers an Intel Core i7 processor and an Nvidia RTX 2060 for less than the competition. We haven’t reviewed this mid-range gaming laptop quite yet, but these specs for this price is a no brainer. You do have to give up a little in the way of build quality, but that’s a worthy trade off. Looking for another option? Check out the best gaming laptops.